LaSalle’s Francis Mijares connects for a single, and he was 2-for-4 with a run. As LaSalle Manager Oscar Benitez put it, this is playoff baseball. The top-seeded Lions needed a five-run rally in the bottom of the sixth inning to pull out a 8-4 victory over Ransom Everglades in Tuesday’s 4A-15 playoff semifinal, played at Paul Maineiri Field at St. Thomas University in Miami Gardens. Forget that their opponent had twice as many losses as wins, and that LaSalle had already beaten them twice this season; it was exactly the type of game Benitez had been expecting all along. That was the case for Ransom Everglades starter Royevan Armas, who worked his way into the sixth inning with a gritty, near-heroic approach. But trailing 4-3 and coming down to their final swings, the Lions (12-13) erupted for a big rally that carries them back into the district championship, where they will face TERRA following the Wolves’ 3-1 victory over Doral Academy in the other 4A-15 semifinal. Unfortunately for Ransom, the Lions also brought their ‘A’ game on Tuesday. Mike Matheis started for the Lions and did not allow an earned run. LaSalle finished the game with 10 hits in all, but up until the sixth the team had little to show for it after stranding nine runners on the bases. Yordan Piedra was hit by a pitch leading off the inning, and Nick Canino followed by sending a line-drive straight back and off of the pitcher. A defender chased the ball down and attempted to make a late throw to first, but the throw went wild to allow the speedy Piedra to race all the way around the bases and home. Canino quickly followed him home with the decisive run when Elier Rodriguez sent a blooper into right field for an RBI single. It was a fitting end to the day for Rodriguez, after the Lions catcher was 3-for-3 and also walked to reach base in all four trips to the plate. Rodriguez was a part of every scoring inning for his team, and he jump-started them early on when he crushed a shot deep to right field for a triple in the bottom of the first inning. LaSalle built a 3-0 lead early on, highlighted by a big second inning in which Piedra lifted a pitch low in the zone and drove it deep to left field for the team’s second triple of the evening. Canino connected for a sacrifice flyout to send Piedra home to open the scoring, and after Rodriguez singled to extend the inning and gave way to courtesy runner Steven Fajardo, Alex Garcia sent Fajardo home on a deep shot to the right field corner. Garcia was 2-for-3 with a walk on the night. 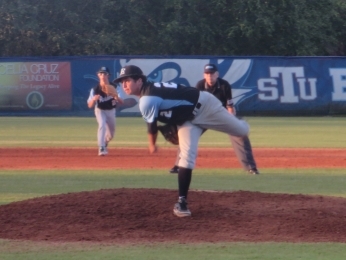 Royevan Armas came just one pitch shy of going the distance for the Raiders. 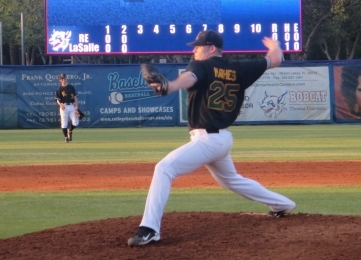 The run support helped Lions starter Mike Matheis settle into a groove, as the right-hander went five innings without allowing an earned run on a hit and two walks. “Mike’s a great senior, a great leader. He did a great job of pitching. He controlled the strike zone and he did everything he needed to keep us in the game and allow us to come back,” Benitez said. 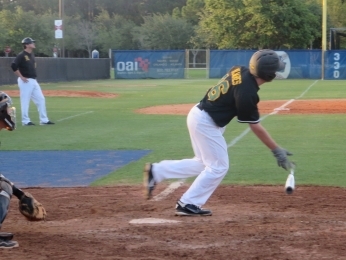 The Raiders (7-15) battled back in the top of the fifth inning. Centerfielder Garret Rubin was hit by a pitch and Caleb Bush reach on an error to put two runners on with only one out. Jimmy Gutierrez followed with a tough at-bat before he sent a roller up the middle that loaded the bases. Chris Rossi then dropped a bunt down on a suicide-squeeze play that brought Rubin and also Bush in and put Rossi on first on a throwing error. Ransom then hit redial, as Alex Friedman also bunted on a suicide-squeeze to score Gutierrez and tie the game at 3-3. The maneuvers also drew the applause of Benitez. Early on in the contest, Garret Rubin had been called out on a stolen base attempt on a play that would have put him in scoring position with no outs in the inning. It was a questionable call, and the baseball gods were listening. With the game knotted in the sixth, Raiders catcher David Lanster poked a single into right field and then stole second base to get into scoring position. Rubin singled to centerfield to push across Lanster, and he advanced to second as the throw went home. Fittingly, Rubin stood on second base and celebrated as the Raiders had their first lead of the ball game at 4-3. 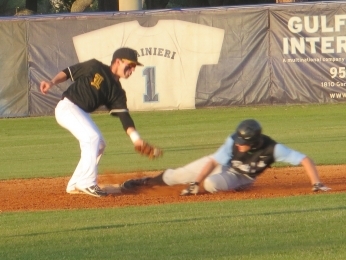 Ransom Everglade’s Garret Rubin is called out on this stolen base attempt in the second inning. But after LaSalle battled back to retake the lead, reliever Anders Gutierrez shut the door in the top of the seventh to secure the victory that improved his record to 4-3 on the season. Gutierrez picked up three strikeouts in his two innings of work, while allowing a hit and two walks. For Ransom, Armas nearly went the distance in the loss in throwing 106 pitches.